Since the 6th of August 2014 a right to film, photograph or make an audio recording of proceedings at a local government meeting in the UK has been established in law. In November 2014 Cambridge City Councillors unanimously agreed to update their constitution in light of the new law. Cambridgeshire County Council’s stance on filming has been compatible with the law for many years as it encourages filming, recording and taking photographs at its meetings. Despite the clear law I have recently experienced some challenges filming Cambridge City Council meetings. I have had a council officer stand in front of my camera, a councillor ask me to stop filming, and a councillor, in public during a meeting, state I was putting people in danger by filming council meetings. I want to see recording and reporting on council meetings become an easy, routine, thing to do. I want to help remove hurdles which might deter individuals, professional journalists, campaign groups, and indeed anyone at all, from videoing, recording and photographing meetings. I want to see more material from council meetings on the TV, on local news websites, and being shared by individuals and campaign groups. I want to see groups discussing how the city is run being informed by reports, and footage, of councillors’ deliberations and decisions. Since the new law came into force three members of the public who have used public speaking opportunities at council meetings have objected to my filming. Two objections were raised as the individuals started to speak, and one individual approached me in a break in the meeting after they had spoken. I have spoken to all these people, and two of them explained their views to me. In both cases their objections were not only to filming but also to reporting of their contributions. In both cases the public speakers appeared not to appreciate they were contributing to a council meeting in public, minutes of which would be published, and which they should reasonably expect to be reported on. Members of the public not wishing to be recorded, or reported on, at council meetings should be invited to speak to officers, or the meeting’s chair, prior to the meeting. This would enable the nature of a meeting, as a meeting in public, to be explained, and advice given on more appropriate routes to raise matters individuals do not want to raise in public. Encouraging pre-meeting discussions might reduce the incidence of people being recorded asking not to be recorded as they start to speak. People’s reasons for not wishing to be filmed, could if they wished, be made public at the meeting enabling those recording to consider them when deciding if to record, or subsequently publish the material. Exactly what an individual objected to: filming, minuting, reporting, audio recording etc. could also be clarified. The council should publicise the right to record meetings, both to encourage more reporting from council meetings and so members of the public attending and contributing to meetings are not surprised by recording and reporting. The council already place clear signs at meetings noting recording may take place so go a long way towards this. p176 of the Cambridge City Council constitution states: “Anyone who does not wish to be recorded should let the Chair of the meeting know.” This message is repeated on meeting agendas. Making this statement without noting the right to film and record can mislead people into thinking public speakers have a right to insist their contributions are not recorded, or even reported on. I have seen a meeting chair make clear they have no power to stop filming but such a statement is not routine. I think if any statement on filming, recording or reporting is made the right to record ought be mentioned. Meeting chairs, and councillors in general, should be aware that not all recording will be overt. Comments and directions relating to filming should be made to all present and should not specifically target those recording overtly. Councillors should take care not to try and control who can effectively report on council meetings. The council should open up formal routes for participating in council meetings without needing to appear in person. Why Film, Record or Report on Members of the Public? I think it’s important to address the question of why members of the public might be filmed or recorded at council meetings. One reason is simply they may be present in footage focused on councillors. Two problems I have experienced at the North Area Committee occurred when filming a councillor who had chosen to sit among members of the public rather than on the “top table” alongside other councillors. At some council meetings many councillors sit among the public. In addition public speakers can, sometimes, have a huge influence on councillors’ decisions, which in turn impact many people’s lives, on occasion significantly. Public speakers can have a huge influence on decisions which councillors make. 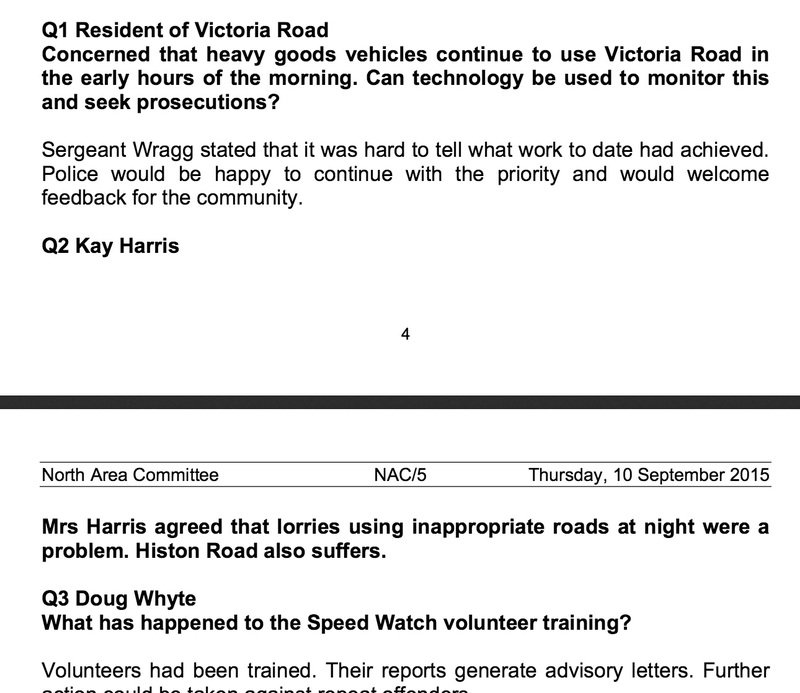 Recent North Cambridge police priorities focusing on anti-social cycling appear to have emerged as a result of public speakers at meetings complaining about cycling on pavements (with councillors not questioning speakers on if they were referring to legal use of shared use pavements or not). Other clear cases of members of the public having significant impact on councillors have occurred. One came when Emma Chin made an emotive speech to the West Central Area Committee prompting councillors to support a shake-up in Cambridge’s residents’ parking permit regulations. A further astonishing case occurred when councillors on the South Area Committee decided to allow a home to be split into two dwellings after a public speaker made an emotive contribution saying the extra rent which could be obtained for a split property was required to pay for care costs. Given the huge and clear influence public speakers can have on substantial civic decisions I think it is right to film, record, and report on what they say at public council meetings. I think many councillors struggle to consider the wider public interest when faced with a person passionately putting a case directly to them. It has been suggested to me that the minutes of meetings ought be all that’s required to support reports and actions following council meetings. Councillors at Cambridge City Council meetings generally vote by putting their hands up, votes by individuals councillors are rarely recorded. Video footage enables people to see how individual councillors have voted on particular matters. My first photograph at a council meeting was taken to record a very important vote where who voted which way was not captured by the minutes. Minutes are not a complete record of what was said, they are generally a summary, and what goes in them is controlled by councillors. Minutes also take a long time to emerge whereas photographs, video and tweets from meetings can disseminate news, and decisions, much more rapidly. Councillors’ body language, and reactions to other speakers, can also be of interest. A video or photograph can show if a councillor is listening to debate or chatting with others on the sidelines of a meeting. A video clip, or photograph, is also simply more engaging than text buried deep on the council’s website. Some have suggested a transcript of a meeting would preclude the need to film or record. Transcripts are very expensive and/or time consuming to produce. Recording would be needed to base any transcript on. Transcripts are very useful, I’ve produced a couple (eg. Labour Anti House Sharing Motion Defeated and Cambridgeshire Police and Crime Panel – March 2014). I think all means of reporting, recording and sharing what goes on at a council meeting should be encouraged. I experienced some challenges filming Cambridge City Council’s North Area Committee, on Thursday the 10th of September 2015. What should have been something simple and routine turned into a very challenging and time consuming exercise. I didn’t attend the meeting primarily to film and report on the meeting, I went to listen to my fellow local residents’ views and concerns and to observe my local councillors using their opportunity to hold the local police to account and set the area’s new policing priorities. I also went to participate, by lobbing councillors in public, via the routes for public participation in the meeting. There were a number of reasons I decided to film the meeting. I thought it was something useful I could do for the society I live in; a way I could altruistically volunteer to do something of use to my fellow residents of North Cambridge. Filming meetings enables those who couldn’t, or didn’t, attend to watch what happened at a time that suits them. I also think its valuable to publicise what our councillors do; I hope that greater transparency will lead to better councillors being elected which in turn will lead to a safer, more pleasant and prosperous city where more people can find an appropriate place to live, and where there are fewer crime and road related injuries and I and other residents will be in a better position to pursue the endeavours we choose. When I lobby councillors I like to do so in public and filming allows me to share how I used councillors’ valuable time at the publicly funded event. I am a passionate believer in democracy and seek to engage with our democratic system as a route to solving problems, or capitalising on untapped opportunities, I have become aware of. I generally push for systemic change via our democratic system rather than focusing on for example direct action, or legal action as a response to matters I come across. A video of the meeting enables me to support my tweets and other reports with additional evidence if their accuracy is challenged, it also helps when acting on occurrences and bringing them to the attention of others such as the established media, elected representatives who were not present themselves, and other campaigners. I was aware that some councillors at the North Area Committee, and some regular attendees, opposed the filming of local council meetings, despite the new, clear, law. Perhaps weakly, and in the interests of avoiding conflict, I decided only to aim my camera at councillors, and “top table” speakers – public sector officers including the local police sergeant. Signs were present on the doors to the meeting room, and at the front of the room, making clear to those attending that filming and recording may take place, inviting people who didn’t want to be filmed to let the chair know. There were also notices in the meeting papers. I filmed in a very overt manner with a camcorder on top of a large tripod. Filming council meetings is becoming routine and for almost an hour I just left my camera running filming proceedings and no reference was made to it. (Others may well have been recording, and photographing, more surreptitiously). No one during the whole meeting asked not to be filmed prior to starting to make their contribution. During the policing item there was a discussion of enforcement of the overnight vehicle weight restriction which applies to Victoria Road. The local, Arbury Ward, County Council Paul Sales (Labour) was referred to in the debate, a resident speaking on the matter spoke of correspondence with him. Cllr Sales as the County Councillor would also be the appropriate elected representative to pursue various solutions to the problems such as better publicity and signage for the weight restrictions. Cllr Sales’ apologies for absence had been given at the start of the meeting and he was not present alongside other councillors at the table with microphones at the front of the room which I was filming. When another public speaker began to make a contribution I turned round to listen and was astonished to see Cllr Paul Sales sitting in the public seating at the back of the room. I thought it was scandalous and appalling that he had not stepped up and identified himself when he, and his ward, had been mentioned. I thought it very important to record Cllr Sales’ behaviour and the way he was failing to take part in the discussion. I thought some Arbury residents might not realise their councillor was present. I turned my camera to record Cllr Sales’ presence in the room. When I turned my camera around suddenly the individual speaking pointed at the camera and rather impassionedly, and loudly, said: “excuse me, I don’t want to be filmed will you please turn that away from me”, the speaker immediately repeated the statement saying “excuse me will you please turn that away from me and I want it recorded that I have asked for you not to record me”. By the time this statement had been made a council officer had taken a position in front of my camera obstructing its view and the individual stated “right thank you” and continued with their speech. I note the request was specifically made towards me, it was a request that I didn’t film, it was not a notification to the chair that the individual did not want their contribution filmed, or recorded, by anyone present. I did not take any action. The event was apparently over before I had even begun to take in what was happening. I thought there was a significant public interest in filming Cllr Sales and was keen to keep doing so. I was not able to instantly determine if ceasing to film the individual complaining was appropriate, she may well have been about to make a newsworthy contribution to the meeting which there could have been a significant public interest in recording and publicising. Can I ask Mr Taylor, erm, obviously you are allowed to film this meeting but can I ask you to respect the wishes of the public not to be filmed thank you. I think it was wrong of the chair to address his comments to me. If he had wished to relate the member of the public’s request not to have their contribution filmed, photographed or recorded he should have addressed that to all those present; I don’t think he should have used his position to reiterate the individual’s specific request to me. Imagine if a public speaker only wanted their contribution to be filmed by an individual, or organisation, they thought would give them favourable coverage for example. Consider a party candidate for election only allowing their contribution to the meeting to be filmed by one of their party activists – would such a request be endorsed by the chair in the same way? Could you clarify if Arbury’s County Councillor Paul Sales is present at today’s meeting. I thought I spotted him at the back of the room which was why I turned my camera towards him. He was mentioned during the item discussing Victoria Road and as correspondence with him was mentioned and a number of his constituents are here I thought it was right to try and report how he was performing this evening holding the police to account for the priorities set. Cllr Sales, would you like to join us? Cllr Sales declined to move, saying something about waiting for an appropriate moment, he also emitted some unintelligible mumbling. Had Cllr Sales been at his seat at the table he would have had a microphone though which to address the meeting. Cllr Sales did eventually move to the front table but took no part in the discussion but did join in the unanimous vote to agree the police priorities. Following the meeting the leader of Cambridge City Council has tweeted to support councillors choosing to sit in the public seating. The public speaker who objected to being filmed was Kay Harris, a representative elected by Cambridge City Council’s tenants (there are around 7,000 council homes so at one vote each Kay Harris has a larger constituency than any North Cambridge councillor). While Kay Harris was not taking part in the meeting in her role as an elected representative councillors may have been aware of the role and given more weight to her contribution in light of it. Given that the heading of this is “police and safer neighbourhoods” I do want to raise the issue of Mr Taylor earlier on refusing to accede to a member of the public’s wishes not to be filmed whilst addressing this meeting. We as councillors know that we are here and you can film us that’s what we are here for. You do not know Mr Taylor that any of the people in this room are not victims of domestic violence, that they are not reporting a crime for which there may very well be repercussions, when your video appears on YouTube. So from my point of view, and I mean I hope I’m speaking for all of us. Film us. Film those members of the public that don’t mind you filming them. But when you are asked to stop filming them, stop filming them because you could be putting people in danger and I think I can’t stress that highly enough. You need to stop and grow up. I have experienced something similar before when Liberal Democrat Councillor Belinda Brooks-Gordon claimed that my filming of meetings could result in her constituents being burgled. An individual who I believe was regular North Area Committee attendee Leila Dockerill, apparently stirred into action by Cllr Price’s speech shouted out “you can take mine off then”. Cllr Price was applauded by the deputy leader of the council, Carina O’Reilly and Cllr Margery Abbott. I think Cllr Price abused his position to attack me. Had Cllr Price wished to report my, or any other individual’s, behaviour to the police, alleging that people are being put in danger he should have used a route other than a public meeting to raise those concerns about specific people. I don’t see the relevance of any of those present being victims of domestic violence. Filming of public areas and events is common and if someone is in public they may well be filmed and their image put online. We have a clear law, and the fact filming may take place at the meeting was clearly signed. Those attending a council meeting should expect to be filmed, recorded, photographed. It is now common place for filming and photography to take place at meetings. Does Cllr Price think that someone at a televised football match ought be able to suddenly declare they don’t wish to be filmed prompting broadcasters to immediately cease recording? As for people reporting a crime for which there may be repercussions – that’s a bizarre statement as an area committee is not a route though which people can, or do, report crime. If someone did seek to report a crime I suspect they would be stopped by the chair or police and advised to use a more suitable route. During a break in the meeting I approached both Leila Dockerill and Kay Harris, and offered them my contact details if they wanted to get in touch with me to set out any concernes they might have with my publication of material recorded at the meeting. Both declined. The next filming related occurrence came as I was approached by Gaynor who had spoken earlier in the meeting. Gaynor claimed not to have realised I was “running that camera” and asked: “Did you film me asking that question?”, I said yes, Gayor then asked me to “remove it”. Gaynor’s field of work was cited as grounds for making the request. I offered my contact details and invited Gaynor to write to me to explain what there case was for not publishing the material and gave an assurance to balance that against the public interest in publication. Essentially while as an individual I am not subject to much of the Data Protection Act I am prepared to go above and beyond what’s required of me and voluntarily behave as if I am. I try very hard to act considerately and responsibly. I was filming a local council meeting in the area where I live. I explained that my concerns about setting a policing priority to tackle vehicles disobeying a weight restriction, over crimes causing injuries and harm. Gaynor said: “so you’d rather put my life at risk… my personal safety”. Later Gaynor clarified she was happy with my publication of her first name and voice but wanted her image and surname to be removed from my publication and reporting. Cllr Kevin Price assured Gaynor that her name would not be included in the published minutes (public speakers were named in the previous minutes, and names were requested on the question submission from, and read out by the chair). I doubt Cllr Price was in a position to give the assurance he gave but it will be interesting to see if councillors debate Gaynor’s request at the next meeting. I do not think Gaynor’s claim that her life, or safety, would be put at risk by publishing her image or surname is credible. While I am not publishing her surname here I am not concerned about publishing material which could identify her. Gaynor publishes a detailed LinkedIn page which shows she is an ex Cambridgeshire County Council officer, it gives details of her current work as a consultant to local councils. Gaynor works through her own consultancy business (apparently as a sole trader) which is listed on various websites including 192.com and Hoovers.com giving a domestic residential address (Gaynor claimed to keep where she lives private). A photograph of Gaynor can easily be found online. Gaynor’s work for local councils is published with her name on it, and it has been covered in the national media, with her name mentioned. It doesn’t appear to me that my publication of a surname and image would add to the information already openly available, some of which is published by Gaynor directly. I am concerned that Gaynor is someone who thinks that feigning upset and claiming her life could be put at risk by the publication of her name and image is a way to dissuade reporting of her public, civic, actions. My conclusion is that publication of the surname and image would be perfectly reasonable and could not conceivably create any increased risk to Gaynor’s safety. I removed Gaynor’s image from my initial publication of the video from the meeting to allow Gaynor to write to me to explain why she thinks I should not publish footage of her at the meeting. At the time of writing, well over a month later, I have received no such correspondence. Arguments for publication include enabling those not present at the meeting to see a fuller, less censored, version of events. Around 37,000 people live in the area covered by the North Area Committee and only a handful were present observing the meeting in person. Not censoring Gaynor’s surname might it easier for people to get in touch with Gaynor – perhaps local media might want to invite her to debate her views on the policing priorities in other fora such as TV or radio interviews, or in the newspapers. A robust public debate might then help inform the next round of police priority setting by councillors. I have also considered that councillors considering engaging Gaynor to carry out work for them perhaps ought be aware of Gaynor’s fears that her work could put her safety at risk – something which might have an impact on what she includes, or omits, from reports. Leila Dockerill then approached me, pointed at the camera and said: “If I’m on there I’ll sue you”. I offered my contact details again, I think her reply to me was: “I don’t want to talk to you” and the line “if I’m on there I’ll sue you” was repeated. As of over a month later I’ve not received details of any claim, no letter before action, and indeed no correspondence at all from Leila Dockerill. In response to me offering my contact details to Kay Harris I got the response: “I’ll just knock on your door and speak to you because I know where you live”. I replied “yes, you’re welcome to do that” I have not had any visit in-person and no note through my door to suggest a visit while I’ve been out. The further individual who had not spoken during the meeting and was interfering in my conversation with Gaynor said: “I will put in a formal complaint” expressed a desire for me to be banned from attending council meetings. Given correspondence following the meeting I believe this to be Aslan Shand. I have briefly responded to the messages I have received from Aslan Shand to state they do not accurately reflect what occurred. Despite acting in as careful, and responsible, a manner as possible and trying to avoid conflict, after filming the meeting I was subject to a couple of days of persistent opprobrium via Twitter from people opposing my actions. Some people including who was at the time a councillor support the recording and publication of full, unedited, recordings of meetings. I would like to see filming, recording, and reporting council meetings become easy and routine. I would like to see the established media filming and photographing meetings. My experience shows there is still work to do to change the culture to make it easy for people to use their right to film and report. I am very concerned that by acting in a responsible manner and editing out individuals from my footage while considering publication I am setting a high bar for others who may wish to record, and report, on council meetings. I suspect many more people will have the ability to use a mobile phone to record, and share, a clip of a council meeting than will have the equipment, capability and time to selectively edit, crop and censor footage. There is also a question of how many people will be willing to put themselves in a position where they are at risk of being attacked for their activities by councillors and the wider public. A journalist who was a member of the National Union of Journalists, and subject to their rules, which include a code of conduct would be required to resist “threats or any other inducements to influence, distort or suppress information”. I’ve certainly censored my footage from North Area Committee as a result of attempts to make me do so. I hope that my being open about what has happened and why I’ve taken the action I have goes some way to mitigate the impact of my decision. I have spoken to many professional journalists about recording council meetings, for publication / sharing in Cambridge and while time and resources is the top reason given for not doing so a close second is concerns about how to respond to requests from councillors, or members of the public, not to film or record and the potential for conflict. I should note I have been aware a number of journalists, and others, recording meetings, but not in a particularly overt manner, so not attracting comment from councillors or public speakers. As for publishing the removed material from the September 2015 North Area Committee, I have considered this and think that the additional benefit gained by the publication, now I have published a redacted version, does not make it worth doing. I face risks to my own reputation from any course of action I take. Reputation matters as without it I can’t as effectively campaign to remove injustices I have experienced and observed in our society and try and make Cambridge, the UK and the wider world a more pleasant place to live. I note that in Cambridge I report on and engage with, what our elected representatives do as an individual, I am not protected by any corporate body. I think it is right to try and use our democratic system as a route to improve our society (as opposed to turning first to other options such as direct action, legal action) and publicising what our elected representatives do is a key part of how I am seeking change. So that needs to be respected. Can you switch it off. While at this meeting councillors ignored Mr Price’s comments at other meetings public calls for action against cyclists have resulted in policing priorities being set targeting cyclists. I’m concerned that priorities by councillors putting too much weight on emotive, in person, speeches from people like Mr Price claiming his wife was “almost felled” by a cyclist and not putting enough weight on what causes injuries, what causes serious injuries, what crimes impact people in other ways and the costs of crime. If councillors had accepted Mr Price’s wishes we could have seen unfortunate students, new to Cambridge and perhaps new to the UK, arrested and charged with serious crimes for failing to rapidly get to grips with Cambridge City Centre’s complex rules on where you can and cannot cycle. (I personally didn’t spot the cycle by-passes to no-entry signs until reading the Cycling Campaign / County Council cycling map years after I arrived in the city). I spoke to Mr Price after the meeting, he was keen to see cyclists dealt with as violent offenders or those threatening violence would be. While he wasn’t clear in the public session of the meeting he told me he was happy to have his voice recorded, but didn’t want to be filmed. When I noted there had been some response on Twitter to his choice of language he said he also didn’t want his comments reported. Mr Price until recently has been a committee member of the Park Street residents association and appears to remain a committee member of the apparently inactive Jesus Green Association. I mention this because Liberal Democrat Cllr Ian Manning has suggested anyone representing a lobby group ought not be able to opt out of being filmed. Cllr Manning has not proposed a motion to either Cambridgeshire County Council or Cambridge City Council’s North Area Committee seeking to get those bodies to take a stance of opposing the law giving a general right to film local council meetings. Similarly Cllrs Holland, Price, O’Reilly and Abbot have failed to back up their comments with proposals to change their council’s rules. I’m generally very happy with the current position – we have a clear right to film local council meetings set out in law. I can request and I will happily do so if necessary that filming proceedings that those who may not wish to be filmed may be stopped on polite request to the person filming but unfortunately I cannot require that person to stop filming if they do not comply with that polite request. I can of course stop recording if it disrupts the meeting itself. Explaining more clearly that the law does not give the council, or individuals, a right to stop or prevent filming might help prevent people being surprised by recording and reporting of meetings. I think that once the existence of the law permitting the filming etc. of council meetings becomes more widely known the problems will disappear. Cambridge’s North Area Committee currently requires public speakers to give their names, names are recorded in the minutes. I have tried using a pseudonym but the chair insisted on calling me by the name he knew me as. Councillors may want to consider allowing people to submit questions without giving their names. I have suggested making it possible to submit questions to council meetings via an online forum enabling participation by those who can’t, or don’t want to, attend meetings in person. Online deliberation could advance debate, and enable information to be gathered, making better use of the time at the public meeting. Councillors may wish to adopt procedure for people to make submissions anonymously in person – akin to those used for an anonymous witness in court. I don’t think an area of a meeting room which is not visible from permitted camera positions is practical – how would you control who can access the private area, and how could you stop people inside recording? I’ve thought about the kind of situation where such a facility might be sought – for example a scientist who conducts animal experiments wanting to support a planning application for an animal research laboratory in the face of threats to their life from animal rights extremists. I think even in that, most extreme of examples, if someone wants to take part in a public meeting they need to be prepared to be filmed and reported and if the actions of criminals are threatening the functioning of our democracy and preventing or deterring people from taking part then we, and our councillors, should ask our police forces to facilitate democratic decision making. I want to also add that the fall out from what ought to have been a simple civic action, filming a local council meeting, turned into a highly stressful experience both at the meeting itself and afterwards as it has been very time consuming editing footage, dealing with debate on Twitter, and preparing this article. Some, but not all, of the challenges I have faced have occurred during the policing agenda item at area committee meetings. It is notable that filming of Neighbourhood Panel Meetings in Swavesey, by the police themselves has been controversial. The police live stream the meetings and make the footage available online. On the subject of the live-streaming of meetings: this was a pilot attempt to increase participation and inclusion. I am keenly aware that not everyone who would wish to attend the panel meeting is able to do so due to traveling times or work/family commitments. I strongly believe that we need to do everything we can to make these meetings open to all and that policing decisions should be made as openly and transparently as possible. I would also stress that these panel meetings have always been public, never closed, and that they have never been the correct forum for sensitive or confidential matters to be raised. We emphasis this point at our meetings and our staff make themselves available after the meeting for any private matters to be raised confidentially. The email to which you refer was not a notification of a change in format but rather an attempt to publicise the live-link to the panel meetings. In the event, the live-streaming was a considerable success. We received many positive emails and comments in person. We were subsequently advised by one of the regional NHW co-ordinators that nobody had raised any concerns to him about the live-streaming and no other concerns were made to us – quite the opposite. The overall ‘look and feel’ of the meeting was not affected and nearly 250 people logged in over the course of the three evenings, compared to about 60 people who attended in person. We were able to engage with people on-line in real time and this now makes it possible for anyone in South Cambs to attend these meetings irrespective of their personal circumstances. Furthermore this was achieved at virtually zero cost to the tax-payer. In my view this represents a successful experiment in digital democracy and we intend to carry it on, while ensuring that the appropriate safe- guards are in place for those attending the meeting in person. I agree with what the Chief Inspector has said and think the same case can be made for filming, and publicising meetings in Cambridge where police priorities are set after hearing from the public and where councillors get the opportunity to hold the police to account locally for their performance. Changes do upset some people. Those such as neighbourhood watch co-ordinators and people purporting to represent others via residents associations might well see their power and influence eroded by opening up meetings to the public more widely. I don’t think this is a bad thing, you can’t always avoid upset when things change and you have to take a balanced view weighing up any individual upset against the public benefits. I have been reading your tweets to day suggesting that you are considering making available footage from last week’s North Area committee which includes footage of people who specifically asked you not to film them or show film of them. Please do not do this. I am not asking you because the council does not want the content of their questions in the public domain, but because those individuals have specifically asked you not to do this . I believe it is a reasonable request that a reasonable film maker would listen to and act upon. I know you have a strongly held view that people who are at public meetings are in the public domain and you may not be able to empathise with the distress this is causing them. But it is causing them real distress that could be easily be alleviated by you not showing this footage. I would be more than happy to meet with you to discuss how we can balance your desire to film all aspects of future council meetings with the needs of those individuals who wish not to be filmed. Because it is something where I believe we do need to find a balance and it would be helpful to try to find a way through this before you film another meeting where similar issues might arise. I don’t think the Chief Executive of a council should be writing to those reporting on meetings in this way. Before becoming Chief Executive this same officer wrote to me to pass on a councillor’s complaints about my reporting of a meeting. Personally I would find it harder to report as fully and comprehensively on the content of public questions raised at council meetings if I was not able to record them. I have now, in this article, made a number of suggestions for reducing the chances of members of the public being upset by recording and reporting of council meetings. As well as being published online via Twitter, YouTube, Vimeo and my own website footage I have taken at public council meetings has been published on the Cambridge News website and broadcast on the BBC and ITV, it can clearly help get what our councillors’ antics in front of a much wider audience than are ever present observe in person. There is also an indirect effect as published footage enables others wishing to report, second hand, from meetings to obtain quotes and records of votes. I think there is clear value in recording and reporting from council meetings in the way I do. I equally think that if someone just wanted to use their phone to record an exchange for their own personal purposes that would be an equally valid exercise of the right to record at a council meeting. To an extent I use technology to make up for what I am unable to do without it. It enables me to see further – to read name plates and work out who is speaking for example and to play back comments made a number of times to try and work out what was said. Restrictions on using technology would make meetings less accessible to me and I expect more so for others who rely on technology even more. I have in the past, before the new law came in, been asked by meeting chairs and officers not to film children taking part in council meetings. Children can be used by parents to present views to councillors, and people who may well be children, the mayor’s cadet and the mayor’s work experience student, play a role in council meetings. Children are on occasion observers of council meetings; generally a class or two will be invited to the council’s annual general meeting for example. Prior to the law coming in Cambridge City Council’s rules allowed people to opt out of being filmed, I took the view that children were not capable of making the opt in/out decision so did not film their contributions to meetings, or them observing. Now I think that parents ought be aware that council meetings are public places where all those present could be filmed and filming all those present and taking part is reasonable. I would oppose any system which involved asking people their ages before allowing participation. I’ve seen comments made at council meetings by members of the public appear on the front page of the local paper, my own contributions have been live tweeted onto the Cambridge News website front page. Council meetings are clearly public events where what anyone says and does ought be expected to be reported and shared in all manner of ways. I hope that the problems I have experienced will go away as people become more used to council meetings being events which are routinely recorded and reported. This entry was posted on October 22, 2015 by Richard Taylor. At Cambridge City Council’s full council on 22 October 2015 four different people overtly filmed parts of the proceedings. Me, Cambridge TV news, Antony Carpen and Liz of Unison. No comment about filming was made at all; and Antony Carpen and Cambridge TV News moved around the chamber to get different angles with no objections being raised. I too obtained multiple angles as I started filming from the public speakers’ seats as I was asking a question. I find it amusing that a cursory google search for “Leila Dockerill” provides links for her appearances at council meetings; one from http://democracy.cambridge.gov.uk/ and another from http://www.cambridge-news.co.uk/ – each providing more searchable information on her than you do. The CEN article also provides details of her address, I wonder if they’ll get sued too? The North Area Committee draft minutes have been produced. The name of the resident, Gaynor, has been omitted but all other public speakers are named. Cllr Price’s comments saying I am a threat to the safety of people in North Cambridge have been omitted from the proposed minutes; as have many other elements, such as the exchange on making decisions on CCTV camera placement. Cambridge City Council no longer suggests members of the public not wanting to be filmed should let the chair know so their views can be passed on. Anyone who does not want to be recorded should let the Chair of the meeting know. Those recording meetings are strongly urged to respect the wish of any member of the public not to be recorded. The council’s civic affairs committee on the 17th of February 2016 recommended constitutional changes but did not seek to amend the elements relating to filming. This change, and the filming of a full council meeting by the council itself, are positive, but they don’t appear to have been made following discussion at a public meeting. Apparently @camcitco is doing its own filming of the meeting this evening, for the first time. I don’t like spending time looking backwards to the minutes but I think its worth it in this case. The name of the first public speaker at the last meeting isn’t included but all other names, including my own, for the public speakers are. I’d like to find out why that is and urge councillors to treat all public speakers equitably. (As I was “wasting” a public question opportunity on the minutes I also raised a handful of what I thought were important errors and omissions). On the anonymity of residents who ask questions in the minutes, this is something which has happened before; there have been numerous North Area Committees and other council meetings in the past where if a resident wishes to remain anonymous as far as the minutes are concerned a resident of whichever road that is quite appropriate in my view. Councillor Todd-Jones confirmed that, where appropriate, public speakers could choose to remain anonymous. In addition, during a busy round of public question, speakers often do not give their names and the standard wording in the minutes to reflect this would be ‘a member of the public’. When I was taking photographs of a burnt-out hotel near where I live on Milton Road someone cycling past twice told me it was disrespectful to take such photos but didn’t stop and cycled off before I could respond. Reporting enables, and prompts, discussion of what happened and is a key part of the route to preventing a recurrence, and potentially even preventing deaths. It’s also simply of interest to share with people what’s going on, news is simply interesting to people, sometimes information has practical value to others reasons, such as in this case finding out about the state of road closures. Many individuals and organisations have reported on the fire and its aftermath, most with images, and I have seen many people walking past the site are taking photos. Perhaps there are some people, such as the person who spoke to me, who don’t see the value of reporting, and oppose reporting, perhaps taking a very insular view of the world and not wishing to engage with society. I always listen to comments people make about my actions, perhaps too much, especially in this case where the person didn’t stop to engage in discussion and explain their point of view, but I thought it was worth noting. This comment should be read along with the article above. I sought to film a Greater Cambridge City Deal Local Liaison Forum meeting on the 11th of July 2016. The status of Local Liaison Forums, and in particular if they are formally covered by access to public meetings rules, and so a right to film, record, and tweet, isn’t clear, but it appears they are not. Filming public council meetings in Cambridge has become almost routine though there have been some challenges, for example I did get asked not to film at a recent Greater Cambridge City Deal briefing event on the 24th of May 2016, and an officer tried to eject me by force at a meeting to establish a Local Liaison Forum on the 13th of June 2016. Firstly I’d just like to mention, I’ve just noticed, we’ve got someone here with a camera and you need to be made aware that if you don’t want to be filmed you have every right to say so. It can be very helpful for a chair of a meeting to ask if there are people present who don’t want to be filmed so that those reporting can, if they choose, avoid filming them, or speak to them later about why they might not want to have footage of themselves published and make an informed judgement about reporting. I think it was wrong of the chair, Cllr Noel Kavanagh, to point to me and single me out. While I have been attending council meetings for many years and am used to such things happening I was shocked and shaken by what happened and I imagine it would be very intimidating for someone attending a meeting for the first time. I film overtly at council meetings using a camera on a tripod, others though sometimes just pick up their phones when something interesting is happening, and some of those recording meetings do so covertly – something which is understandable given some councillors’ hostile attitude to those reporting what they do. Any statements on filming from the chair should have been clearly addressed to all present. The chair was interrupted by Mr Bond, someone who in the past has, at council meetings, expressed some outlandish views on the state of the law in respect of filming. My understanding is he wants council meetings to only be reported on via broadcast television due to the additional regulation which applies to that sector. Mr Bond’s views are out of kilter with those of MPs and our local councillors who unanimously support a right to film council meetings. Can I introduce Mr Richard Taylor, photographer of this parish. No thank you Richard, not for me. Right, so there’s one man who doesn’t want to be photographed. At this point I thought it would be wrong to give the impression that I was prepared not to film Mr Bond. Agreeing not to film Mr Bond would have made it pretty much impossible to film much of the meeting and while in this instance it turned out nothing really newsworthy or interesting happened at the meeting I don’t see why those observing asynchronously via the internet ought not be able to see and hear everything which went on. I have previously made a mistake I think by acceding to a request from someone not to be filmed, who then went on to have a significant impact on a decision by councillors. I think it is right to film public meetings in full and then consider later if there’s a case for censoring material prior to publication. The vice-chair of the forum was Cllr Ian Manning who in the past has said representatives of groups should not be able to opt-out of being filmed, so it was with that in mind that I noted Mr Bond does act as such a representative. Officers later told the forum that the meeting had been specifically advertised to such representative groups and one of those present as such a representative asked if there were any people present at all merely as individual local residents. There were about 15 people observing in the room, but the public civic matters under discussion impact many tens of thousands. I am happy that filming the meeting was right democratically, morally and journalistically. I don’t know the law about ermm… you have a right to film have you? I would think Mr Taylor would respect that. I hope? I hope you will respect that? Neither Mr Bond nor chair Cllr Kavanagh mentioned which law they were referring to. I view their comments to be intimidatory nonsense. There is no law in the UK which requires the obtaining of consent before publishing images of people. We have the Human Rights Act which gives a right to a private life, but it’s inconceivable that could be breached by a report of a public meeting. There is also the Data Protection Act but again there’s nothing there which restricts journalistic reporting and there is an exemption for those, like me, who are filming for domestic, rather than commercial, purposes. As I’ve noted in the above article I go above and beyond what is required of me by law and consider any requests to cease processing people’s personal information as if I was subject to the Data Protection Act. I responded to what I took to be a question from Cllr Kavanagh asking if I would respect the request not to be filmed and the claimed strong law about publishing images of people without their consent to say I would not be respecting the request. Again I thought it important to be clear and open. It’s a shame that the tone of the evening has been set by one but person but we’ll change all that. I explained that I thought my filming the meeting would enable many people not present to find out what had happened. Can I just say that despite what’s been said really Richard Taylor should respect the wishes of the members of the public who don’t want to be filmed. They’re not going to but that point should be made. Is there anyone who quite on a serious note, is there anyone who actually seriously doesn’t want to be filmed. If there is I will go and stand in front of that camera. Simple solution. I think we’re fine. There’s no one who does not want to be filmed. Richard, what you fail to understand is that sometimes efforts to improve transparency can create quite a threatening environment for some members of the public. I completely support, in general, attempts at improving transparency – remember it was me that took a motion through the County to record all it’s Full Council meetings and stream them on youtube. However, a minority of people may have good reasons to not want to be filmed, and/or be discouraged from attending public meetings because they know a stranger will shove a camera in their face and they’ll have no control over the editing or use of the resulting film. You failed to respect the Chair’s request to the spirit of not filming people who didn’t wish to be filmed, hence my asking if anyone had a serious reason to not be filmed. The net result was we’d wasted part of the meeting and no transparency was improved or diminished. >Richard, what you fail to understand is that sometimes efforts to improve transparency can create quite a threatening environment for some members of the public. I think my article, and comments, above show I have appreciated and considered that, but on balance take the view, like all of my MPs and local councillors, that the public interest is best served by a right to film, record and report on local council meetings. I think meeting chairs singling out individuals using their right to film creates an unpleasant environment for those attending meetings and wishing to report from them and almost all of the problems which have occurred in Cambridge in relation to filming have in part been due to the actions, or inactions, of meeting chairs. Yes, and I’ve explained why in the article above, and when I spoke at the meeting. I don’t think people should be able to opt out of being filmed, recorded and reported on when they are seeking to influence how we run our society, how we spend public money, and if, and how, we build new bridges and cycle paths. I do go above and beyond what is required of me by law and act very responsibly in relation to any requests not to publish material or to take material down from my website, Twitter, or YouTube. I think it is reasonable to record contributions in the first instance; it’s not possible to balance someone’s wish not to be filmed against the public interest in publishing what they’ve said until it’s known what contribution they are going to make. What’s more is our councillors and MPs have considered this balance and have decided unanimously to provide, and support a right to film everyone at local council meetings, and the members of this forum agreed to follow that approach. None of those councillors who seek to restrict filming from time to time have actually taken their proposals to their respective councils in the form of a motion formally proposing the councils take a stance at odds with the law, none of the forum members present proposed an amendment to the forum’s terms of reference. >no transparency was improved or diminished. Had I accepted the chair’s suggestion I shouldn’t film or record Mr Bond filming many contributions to the meeting, including particularly contributions from a city deal officer who sat with the public, and Cllr Todd-Jones, who sat next to Mr Bond would have been impossible. > However, a minority of people may have good reasons to not want to be filmed, and/or be discouraged from attending public meetings because they know a stranger will shove a camera in their face and they’ll have no control over the editing or use of the resulting film. I understand that may happen; but that now is the position we now have with local government meetings in the UK; people can and do start recording at any time; anything you say at a council meeting may end up on the TV news that evening. I think that’s on balance a good thing, even if some might be put off contributing as a result of more openness. FWIW if a member of the public doesn’t want to be filmed that’s their choice and it needs respecting. Their comments could (and almost certainly should unless there are very good reason not to, though none spring to mind) be reported. Councillors on the other hand are public figures. They are aware that public office means being visible. As far as I’m concerned, that means they must be filmed, where possible, at public meetings including when they take votes on tricky planning applications or other contentious matters. Anyone who attends a public meeting and makes a public comment can expect to be reported upon. That is the way democracy works. People who don’t wish to speak in public, have every right to use other channels. Those who speak in public can expect to have their views recorded. The law supports this. There is no right to privacy in a public meeting. >>Richard, what you fail to understand is that sometimes efforts to improve transparency can create quite a threatening environment for some members of the public. I think for some people, including me, having a meeting recorded makes the environment less threatening. The presence of overt recording may well I think encourage councillors to be more polite and less hostile to the the public, and recordings can be used to back up tweets, articles and other reports from the meeting which councillors might otherwise contest. Given, due to the current state of libel law, every report from a meeting by an individual is made at the risk of losing their ability to provide for their basic needs, reporting as an individual can be frightening; having a recording reduces the risk of a successful libel action in relation to a report from a meeting. I note that while there are strong protections in libel law for reports from public meetings that has not prevented libel threats being made in relation to my reports. Comparing your video to the actual meeting “minutes” demonstrates the inestimable value of what you are doing. I am sure that you can embed the minutes, but the following is all they include from 90 minutes of questions from the public. Thats all folks ! Keep up the good work. This relates to the Chisholm Trail and New River Cam bridge Local Liaison Forum on the 11th of July 2016 (Video, Proposed Minutes). The forum had previously, at Item 10 of its May 2016 meeting resolved “Rules on filming will be as per Area Committee meetings” but that was certainly not re-stated at the July meeting, what happened when I tried to film is recorded in the above comment. As has been pointed out the minutes are brief and omit most of the deliberation, including my suggestion to pro-actively publicise the planning application. I have suggested adding a link to my video in the minutes. Filming and reporting on the 15 September 2016 North Area Committee in Cambridge was very challenging, I felt quite intimidated and threatened. At one point an officer walked right up behind me and started to look at what I was recording and one of my councillors, Kevin Price, threatened to throw me out. The challenge arose due to the presence of children, who I think were primary aged, addressing the meeting. I was approached outside the meeting shortly after I arrived by a children and young people officer from Cambridge City Council who informed me children were going to be speaking at the meeting. The officer told me their parents were aware the meeting was public and likely to be filmed and reported on, but expressed concern the children might be nervous if they were filmed. The officer wouldn’t tell me what the children were attending the meeting for, and I noted people often use children as a proxy [for adult campaigners] and the public should be able to find out what is going on. I suggested the officer express any concerns to the chair and said I would: “take a responsible judgement on both what to film and what to publish afterwards”. (Watch this exchange which forms part of my video of the whole meeting). Even in retrospect I think that was the right thing to do. There was no reference at this point to the item during which a contribution from children was expected. Can I reiterate the point I made, particularly Mr Taylor as you are focusing your camera, not to film the young people tonight. I think there are safeguarding issues that you should be aware of and I think I would really request you not to film them for this item, thank you. Mr Taylor, are you going to continue to film? Can we just stand in-front of the camera? An intimidating officer, the same officer who had stood in-front of my camera at a previous meeting, on the 10th of September 2015, as noted in the original article above, approached me and asked the chair: “what would you like me to do?”. I raised my hand, indicating I was prepared to explain my actions. (This is in-line with usual practice at area committees where members of the public are often permitted by meeting chairs to speak during any agenda item). Cllr Todd-Jones nodded at me and said yes. In order that there was no ambiguity I asked: “Are you inviting me to speak”, Cllr Kevin Price interjected to say: “No”, but chair Todd-Jones said: “well you can make a point but I’m not going to change my view”. I am able to film this senior officer, who you’ve just introduced as a senior council officer, addressing this public meeting of the council. Everybody knows that these meetings can be filmed and recorded not just by me but by anybody here. Lots of people will this evening will have mobile phones and computers, Cllr Manning for example has a laptop in-front of him, anyone here could record this. What I was doing was recording just the senior council officer you have introduced and I think that would be very reasonable. That wasn’t an ideal contribution; I wasn’t expecting to have to speak and had just experienced the shocking behaviour of the officer. Yes Mr Taylor, but in the background you have a group of young people and I don’t think that is appropriate. I repeat my request for you to not film this item. I again clearly indicated I was willing to further explain my actions. I note the reporting restrictions at this stage were being directed solely at me and not at others present. That’s nonsense. (Mr Bond was subsequently appointed by councillors as a member of the “Local Liaison Forum” to discuss the future of Milton Road. Labour activist ex Liberal Democrat councillor Claire Blair, now Claire King, also interjected to heckle saying: “having fun Richard?”. There were a number of comments not clearly picked up by the microphone. I think Cllr Price heckled to call me “an obsequous little man”, and he added “you’ll be asked to leave“. As I spoken directly to the senior officer accompanying the children and nothing was mentioned then I didn’t put too much weight chair Todd-Jones’ comment “I think there are safeguarding issues that you should be aware”. I did though act cautiously and while I declined to stop filming I did decide not to film images of the children speaking. I have always taken an approach of being as cautious as practical with my reporting. I was also mindful that I wasn’t only at the meeting to observe and report, I also wanted to lobby councillors myself, with the aim of making the area a safer and more pleasant place to live, I submitted questions on getting defibrillators installed in the area, on the remodelling of one of the area’s roads, and on local highways improvements. I wanted not to be thrown out of the meeting so I could find out about upcoming changes to the local area, lobby and try to save lives and reduce injuries, and report on what was happening in an effort to help inform people about what the councillors were up to and perhaps better inform future elections. I think it would have been reasonable to film the children making their submissions. When making the decision if to publish or not I would have considered if it was fair to publish. I think it is reasonable to publish uncontroversial views expressed by children – eg. children saying they had a good time if interviewed after a panto, but perhaps not fair when they’re expressing controversial political points, perhaps after manipulation by adults. The decision to publish or not can be taken when in possession of more information, and with the benefit of more time to reflect, than when deciding if to collect information in the first place. I think in the past I have on occasion been too quick to turn my camera away from news when asked to by councillors chairing meetings; particularly in the case of Richard Price addressing the West-Central Area Committee which I mentioned in the initial article above. In the case of older children there’s also a question of not unreasonably discriminating based on age; I think children and young people should be heard in public debate, though decision makers need to be very careful when determining what weight to put on their views. Deciding what to do both in real time at the meeting, and when considering afterwards what to publish is not clear cut and is a difficult, balanced, moral and practical decision. Those reporting, even on social media, are one of the key routes by which what happens at local public meetings gets out to the wider population, particularly when there are no professional reporters present which is often the case, so the judgements made do matter. I note that I edited my video so it did not show the children entering the meeting, and I did not film the children in the meeting. I am concerned that such editing, if it became required, or expected, significantly raises the hurdle in terms of time, and technical equipment and ability for reporting on local council meetings. In the case of the North Area Committee some of the submissions made by the children could come into the “controversial political” category. One matter raise was a call for action against people smoking and taking drugs on green areas near playgrounds; and later one councillor, Cllr Price, took up the children’s submission on drug taking and smoking on play areas when questioning a police Chief Inspector later in the meeting. If councillors put great weight on the submissions we could see councillors calling for a change in the law (banning smoking near playgrounds perhaps), and for police time to be spent tackling people smoking outdoors rather than on dangerous and criminal actives. Decisions made at area committees are often influenced by lobbying, and the decisions can impact thousands of people’s lives, sometimes dramatically, for example when it comes to injury rates. When I was invited to address the committee I was taunted by Cllr Ian Manning who jeered, saying I was shaking while doing so. Councillors’ and officers’ behaviour, and that of a mob of a couple of Labour activists present in the public seating, was surprising, scary and upsetting; I’m not immune to having a physical reaction to intimidation. As I’ve commented before councillors don’t ask public speakers for their ages at public meetings. Reporters and others will not be aware of their ages and it won’t always be obvious speakers are children or young people. Often children are present, often taking part in some way, at local government and the city’s civic events, mayor’s cadet. A class of children is routinely invited to observe the annual general meeting of the city council, and parents reasonably often bring their children along to speak, effectively on their behalf, or on behalf of a campaign at a meeting. Not permitting filming children in the background of a council meeting would typically preclude filming, head on, the ruling group and leader of the council at the annual general meeting, if children sit behind them on the floor of the chamber, as has been the case at those meetings I’ve observed. Children have been used in relation to many campaigns in the city; for example posters on Milton Road opposing the removal of trees, are drawn and signed by children; perhaps as adults might be tackled for fly-posting or because the adults opposing the removal of the trees think using children is an emotive and powerful way of boosting their lobbying. I’ve written this comment now as the next North Area Committee is coming up and I was reviewing what was said at the previous meeting. I note the draft minutes don’t mention the reporting restriction the chair sought to impose. I was also reminded to write this by comments on an article in the Cambridge News about a young person who has complained about streetlights out in a park. The comments appear to have been removed and turned off but suggested it was wrong of the parents to allow the child to have lobbied in public, and wrong of the newspaper to cover it. The commenter suggested it was wrong to put a photo of a young person in the paper because ~”weirdos could look at it”. While there are legitimate concerns about if, and how, it is fair and reasonable to include children in a report; there is I think an undertone of a suggestion it is bad to film or photograph children in general, reflecting I presume concerns about children being abused – a subject in relation to which there is a degree of hysteria in some elements of our society. We see this with, for example, reported photography bans at school plays, sports days, football matches etc.. I think some of those who oppose reporting of local council meetings are willing to jump on the bandwagon of this hysteria. What councillors, and some observers, appear have trouble with is that it is those reporting who have to decide what it is appropriate to record and report, and they accountable for their actions. We do not live in a society where those in power, with the exception of those presiding over courts, can instruct those reporting on what they can and cannot report. These aren’t easy decisions. Consider if the cameras have been turned off, or away from the stage, before William Hague’s speech at the Conservative Party Conference at the age of sixteen? Was it fair to rebroadcast the footage when Hague became an MP? Tory leader? Foreign Secretary? As it turned out Hague’s views later in life were not so far removed from those he held at sixteen, would publication still have been fair if he had held extremist or ludicrous views as a teenager? I think had the latter been the case the moral question would have been a more challenging one. I have considered that one of the problems may be that turning the camera is an action which some people object to; taking two cameras so more of the room can be captured without panning a camera might reduce the problems I face when filming council meetings. If I have a camera filming myself then that might protect me from intimidation, or at least provide me with better evidence of it to share afterwards. One last note – I was very close to shouting clearly at the officer who approached me to “step back”; I was mindful in all my actions though to try and do nothing which could be construed as disruptive and justify the chair from excluding me from the meeting. I won’t link to it as I don’t think it was appropriate but an event attended and ultimately run by councillors at the guildhall over the weekend had children expressing quite controversial views on the future of the city and videos of their presentations were published. There was no sign of appropriate challenge and support being given to assist the children to understand the potential consequences of their proposals. I thought this notable as it shows what councillors do, and permit, when they are making decisions about reporting on children and young people’s contribution to civic deliberations. Personally I wouldn’t knowingly publicise controversial political opinions expressed by identifiable children – I don’t think its fair as they are not in a position to have fully developed such opinions. I think my own record is strong, and I think I’ve made better decisions than councillors, councillors allowed a film to be shown at the North Area Committee publicly identifying children described as at risk from exclusion – I didn’t publish the children’s names or images when reporting on the meeting and reported the occurrence to the Information Commissioner in an effort to prevent similar happening again. Councillors at the Greater Cambridge Partnership published footage of primary aged children using the public speaking slot at the Greater Cambridge Partnership Board on the 11th October 2018. The children are identified by their full names and ages in the meeting papers while commenting on controversial matters of public policy. Those claiming to be concerned about the possibility of children lobbying the North Area Committee don’t appear to have publicly raised any concerns about the practice of the Greater Cambridge Partnership – which to me suggests their claimed concerns are not genuine. While I am to an extent pointing to the material by commenting on it I’m not linking to it. I’ve tweeted a image of the children, not including their faces, addressing the board – screenshotted from the official video – to illustrate a tweet linking to these comments. As an aside, this week has seen the republication of comments by an MP – Jacob Rees-Mogg made on the BBC Radio 4 Today show at the age of 12. That’s someone who might well end up in even higher-office in the next few weeks and perhaps if the mainstream media hadn’t shared the material it would have gone viral anyway. I’ve not shared a link to it. As I’ve mentioned above children are often used in political campaigning; another famous example is campaigners for better cycling infrastructure in the Netherlands in the 1970s. Gaynor has continued to work as an independent consultant to the public sector in the region. I am concerned that by censoring my reporting from the meeting, and my reporting on Gaynor’s behaviour I am denying councillors from the opportunity to be fully informed when considering engaging Gaynor’s services. The problem is that Gaynor claims to fear her work puts her life and personal safety at risk; I fear that means she might not be best placed to do the job the public engage her to do. On the 23rd of January 2017 I sought to observe, and film, Cambridge’s Local Highways Improvements member panel. An officer told me I would not be allowed in. Cllr Rosy Moore arrived and said she thought it was a public meeting; I went with councillor Moore to the meeting and an officer shut a door on me in an apparent attempt to physically prevent me reaching the meeting. Cllr Blencowe and officers emerged and made clear I would not be allowed in. Councillors were apparently taking invited members of the public into the meeting to speak in favour of highways schemes, this opportunity does not appear to have been publicly advertised anywhere. On the 24th of Janary 2017 I arrived at the venue of Cambridge’s Transport Joint Area Committee to observe items on residents’ parking and cycling both ways on one way streets. The receptionist stated it was an invite only members meeting and a security guard told me I was not allowed to film. I asked if I would be physically stopped from entering the meeting and was told no, so walked in, and there was no problem observing, tweeting and reporting on proceedings from that point on. An odd one from Cambridgeshire County Council; a councillor told me he’d send me a bill for filming him, and that filming takes his soul away. and if I’m going to note challenges at other bodies here too, see also: Addenbrooke’s 99.9% Full – Chief Exec Bans Filming Governors Meeting and Draconian Rules Restrict Reporting From Clinical Commissioning Group Meetings. At Cambridge’s North Area Committee on the 14th of December I met some challenges filming. As I entered the venue for the meeting two people approached me and asked that their contributions not be filmed. I asked them why, and they explained they wanted to raise concerns about criminality and feared violent retribution. I suggested they speak to the meeting’s chair with a view to ensuring all those present at the meeting were aware of their concerns. I committed to take their views into account, and noted they needed to be balanced against the wider public interest in transparency of decision making. In the event these people did not make any formal verbal contribution to the committee; one may have heckled and their representations may be one of two or three read out by the police. I made every effort not to film these people during the meeting and believe I was successful. At the start of the policing item the meeting’s chair inappropriately singled me out by name and requested that I not film certain (unspecified) questioners. I thought it was inappropriate to single me out. It would have been useful if the chair had relayed speakers’ concerns to all present so everyone, including councillors, the council officers, could take it into account when deciding what to relay, record and publish. The chair didn’t define filming and didn’t make clear if continuing to record audio would be acceptable. (A previous North Area Committee chair reflected on their actions in similar circumstances and issued a public apology). Making very challenging legal, and moral decisions on-the-fly in an instant at meetings is very difficult. I wonder if actually it would be reasonable to record everything and then decide later what to retain, what to delete, and what to publish. As it was I continued to record the meeting but didn’t film images of those commenting on the policing item; I published everything I recorded during the meeting. One challenge I face is my primary aim when attending the North Area Committee isn’t to film and report, but to use the public speaking opportunities to lobby councillors to make North Cambridge are more pleasant place to live; sometimes that influences my decisions on what to report, as I don’t want to cause a fuss and risk missing that opportunity. I would do more direct activism and reporting on the state of the Fen Road area if it wasn’t for a fear of violence, a concern I take into account myself when making decisions on what to do; I understand the fears of those speaking out. I’ve personally tried to do what I can in a public and proportionate way. I would hope that my reporting on the meeting will help everyone with an interest in the area see what is being discussed; I can’t imagine any element of society condoning shooting ball-bearing guns at others’ homes from vehicles. Publicising the issue, and the responses, could help save lives and reduce the number, and severity of injuries, as well as reduce the fear, and the health consequences of fear, associated with criminality in the area. There is a long way to go before filming council meetings becomes easy and routine. I was disappointed in myself for failing to film Lib Dem activist Cheney Payne asking a public question on unoccupied new council housing in King’s Hedges’ ward. Often Liberal Democrat “local activists” emerge in the months running up to an election and then become candidates, and sometimes councillors. Had I identified the speaker as Liberal Democrat activist Cheney Payne I would have filmed the question; as it was I was seeking to make live real time judgements on the justification to film speakers; turning the camera for example when one speaker, Owen Dunn, referred to the Green End Road cycle lanes, a subject I have campaigned extensively on, and in which there has been immense public interest. I think I am often more cautious about filming public speakers than others (I’ve noticed this when there have been a number of people filming at Greater Cambridge Partnership meetings), perhaps I need to stand up more strongly to intimidation from councillors. Yes, just film me I’m much more interesting. Councillor Todd-Jones smiled broadly at the police comment, and Cllr Manning laughed. The police support for the councillors’ request was concerning; I don’t think it’s a matter the police should have got involved in at all. It’s up to the meeting chair to determine if someone’s behaviour is disruptive and if they should be warned, or asked to leave. It’s only if someone didn’t leave that there is then the potential for a criminal offence such as for example aggravated trespass to have been committed. Perhaps what we have here is a local officer taking the side of local elected representatives in the room; rather than either keeping quiet (which I think would have been the best decision) or supporting the unanimous view of our MPs, which has been to give people a right to film council meetings. If the police were to intervene at all I would have liked to see them preface their remarks to make clear they were not exercising any policing powers, but just expressing an opinion or making a suggestion, which is what I thought they were doing. I don’t think I’ve been keeping the list of challenges faced comprehensive. On the 12th of September 2018 I faced challenges filming Cambridge’s North Area Committee. I have decided to publish the video of that event despite the fact it contains material which it has been suggested I should not have recorded. I had already turned my camera to face Kay Harris before that statement was made. I decided to record the speech and decide later if to continue to hold, and publish it. I decided it was important to do my best not to give in to any pressure from councillors urging me to reverse that decision without giving due grounds for their request. I was always open to considering any further substantive representations, and indeed still am if anyone wants to put anything to me. Had the speech been a personal matter being inappropriately raised at a public council meeting for example I would have ceased pointing my camera at the speaker and would have muted it before publication. When reviewing the speech later I noted the request not to record had been only directed to me; it was not a request to all in the room, or a request to the chair making a case for the contribution not to be recorded by anyone. I think it would clearly be wrong if a public speaker at a council meeting was allowed to decide who could report on their representation. Imagine someone getting up to speak and asking reporters from certain channels, newspapers or websites not to record their contribution. Imagine a party politician making a contribution but saying they wanted only their own party members to be permitted to record it, and seeking to prevent members of opposition parties having a copy. It is very common for public meetings to be recorded by many people. I would not be surprised if a number of media organisations, a number of arms of the council(s), councillors and political parties didn’t have recordings of key meetings. To-date I’ve always recorded meetings in a very overt fashion, others may not. The overt nature of my recording I think sometimes results in attention being specifically drawn to me, rather than others. The fact I publish what I record, and live tweet meetings also draws attention to my actions. In the speech Kay Harris purports to speak for others, saying: “The residents have been saying”. This could be a reference to tenants Kay Harris formally represents as a tenant rep, or could refer to residents’ association members, it might be neither, we don’t know, and we don’t know how councillors would have interpreted that phrase and what weight they put on it. What is important though is that it was said. The substance of the speech was raising concern about rat-running on Campkin Road in Cambridge (an area surrounded by lots of, but not exclusively, council housing) and complaining about street furniture and overgrown planting in the area. Clearly if councillors were persuaded to act to deter rat-running, by supporting a road closure at a point, or lesser actions such as chicanes, or other deterrent devices that would affect (both positively and negatively) large numbers of people. Residents of North Cambridge and beyond should be able to see what councillors are being asked to do and why – to enable informed public debate about how we run the city. I think it’s right that those not present at the meeting should be able to see how councillors are being lobbied. I think it’s worth noting that I did not know at the time how effectively my microphone was picking up Kay Harris’ voice and I expect pointing the camera at a sound source improves audio recording. I note Kay Harris made no claim that any harm would arise as a result of me recording or publishing the contribution; on balance I think the public interest in others being able to see and hear the speech as it was delivered outweighs any impact to Kay Harris’ interests, rights and freedoms. Personally I would not have been able fully to make sense of the speech without listening to it a couple of times on the recording; I was distracted at the meeting by hectoring from councillors. Once councillors started to weigh in on the question of if the speech should be recorded, and one started to advise Kay Harris on what to say, that exchange itself was of public interest and warranted recording and publication – showing the challenges recording and reporting on public meetings. Cllr Thittala even suggested my actions could amount to harassment (which is a criminal offence). For the laws allowing filming council meetings to be effective we need councillors to handle situations such as that which I experienced; people will be deterred from using the right to film if there is a risk of unpleasant conflict. I think there is a particularly significant value in tenants being able to see how their elected representatives acts at public meetings when lobbying councillors; but I think anyone should be, and is, free to record any contribution made to a public council meeting. It’s worth noting, (only to illustrate how poor and open to abuse our law on harassment is), that if Cllr Thittala’s interventions were aimed at persuading me to stop recording at least part of the meeting (as they appeared to be to me) they may be considered to amount to a course of conduct “by which he intends to persuade any person … not to do something that he is entitled or required to do” and that appears to me (I’m not a lawyer!) to fulfil the definition of the offence. the definition excludes behaviour “pursued under any enactment or rule of law” so my recording of a council meeting, under the provisions of the Local Government Act 1972 as amended by the The Openness of Local Government Bodies Regulations 2014 would therefore as I understand it not meet the definition. If councillors want to change their rules they should propose an amendment to their constitution; if anyone thinks the law should be changed they should lobby their MP, emerging candidates, or offer to stand for Parliament with a manifesto including the changes; or indeed start by making the case for changes in public. If we want to change public policy we should use the democratic process rather than seek to criminalise those who disagree. I think council meetings are public places, anything you say at them may be recorded and might appear on television, in the papers, or online; that’s the nature of them. If someone asks to speak at a council meeting and have reporting banned (or reporting by a certain person banned) the meeting chair should simply advise them that’s not possible as it’s a meeting which our society as a whole has decided should be open to the public. I suspect councillors would like to have the powers of a court to impose reporting restrictions; I think it’s right they don’t have those powers – all those reporting on council meetings do of course have a duty to do so morally. A further speech by Kay Harris at the meeting related to the monitoring of CCTV in the council housing estate, a matter clearly closely linked to the role of a tenant representative. I can definitely see where you’re coming from, Richard, and I hope you draw Gerri Bird’s attention to this blog entry, or email her the text, and ask her to consider the wider implications of her repeated interjections in the light of it. Maybe for future meetings, more attention can be given to distinguishing between residents attending in a private capacity, and those representing groups of residents, in terms of seating arrangements, and that would go some way to assuaging Cllr Bird’s discomfort. My own attempts at filming, frowned on as they were initially, and never supported to date, used a fix point, because I was more interested in recording what was said than always being able to get who said it on camera. That certainly seemed to cause less controversy, but I never got satisfactory sound, because the city council’s Civic Suite is large, and proper use of microphones seems varied. Stephen Kelly, Director of Planning, should not have attempted, as a council employee, to interfere by leaning into shot, but I must admit, when you stood up to continue filming, that was the point where I thought, nah, you should have just stayed sat, as you still had the principle of carrying on filming safe, and sound, so to speak. Cllr Thittala, on the other hand, doesn’t seem to grasp that no amount of requests NOT to be filmed should be acceded to if this confounds democratic accountability. Maybe employment law is not the best background to be making pronouncements on possible grounds for a harrassment claim from, and he needs to hit the books again. Since the meeting I have discovered that Kay Harris is a member of the Greater Cambridge Partnership Local Liaison Forum on the Histon Road remodelling. This is a hugely influential position, the road is being remodelled, millions of pounds of public money is being spent. Traffic issues in North Cambridge were the subject of Kay Harris’ first representation so that’s linked to the road remodelling. Liaison Forum members have had huge power over the consultation process and development of plans for Greater Cambridge Partnership schemes. I didn’t know this at the time. People filming council meetings can’t reasonably be expected to have the information needed to make a real-time public interest judgement over if continuing to film in the face of an objection is reasonable or not. Generally I think a reasonable approach is to film and record everything and then make a decision on what to publish. Recently YouTube’s tools for editing already uploaded videos have improved, so if necessary I could mute or redact material after it has been uploaded, without breaking links, and others’ embedding / referencing. I had positioned the camera in-front of me, on a tripod which held the camera at about my head height (I think); the aim was to be highly overt but not getting in anyone’s way. I felt I could safely and easily stand up and hold the tripod against me giving the camera enough height to see over those who were between the camera and the speaker. I was not only recording the speaker, but others who may have been acting to frustrate reporting. Had I not stood up I would not have recorded what was happening as effectively. If I could do so safely again I would – clearly it’s something that’s very challenging to do. Not doing so would make it easy for anyone, councillors, officers, or other members of the public to obstruct recording with ease. I don’t want to see a position where any one person can prevent reporting on a public meeting which can have an impact on thousands; that would be disproportionate and wrong. I have to say on balance that I broadly agree with your policy, especially after reading through much of the blog above. The pantomime last night was ridiculous and completely detracted from the question and the response to the question. Someone should have announced that filming is explicitly permitted at public meetings and that they can’t stop it. A large proportion of those engaging in the kind of persistent and deliberate course of targeted oppression with which the Act is concerned will in the nature of things be obsessives and cranks, who will commonly believe themselves to be entitled to act as they do. it’s nice to have others agree that my approach is generally (no-one ever agrees completely with another person!) reasonable; I have been considering if my behaviour is that of an “obsessive” or a “crank”, particularity as I do believe myself to be entitled to act as I do; but my “entitlement” (a horrible word) arises from the law which now expressly permits filming council meetings, it’s not a personally derived belief in an entitlement. Obvious answer is no. Those at a meeting held in public who make an active contribution to that meeting have no expectation of privacy. Really, I don’t know Richard nor have ever met him, but I am pretty disgusted by the way he is treated, time and time again. ‘Citizen Journalism’ may have become a bit of a ‘dirty word’ to some – worthy of ridicule to others. However, whatever you choose to call it – what Richard has committed himself to, and what he does for the Cambridge community, time and time again – has proven its worth. Speaking on something, I do know about and have seen firsthand as an undergraduate then post graduate – look at the CUSU (Cambridge University Student’s Union) – funded by the University now virtually in entirety), May 30th, 2013 Richard appropriately raised concerns that his application (which had to be made to an employed member of staff the then and current General Manager – not an elected officer) was rejected. Thanks. Just to say I don’t think I expressed concerns my application was rejected – I merely volunteered to do something which I think at that time I was very well placed to do – but wasn’t wanted.